Universal grammar, then, consists of a set of unconscious constraints that let us decide whether a sentence is correctly formed. This mental grammar is not necessarily the same for all languages. But according to Chomskyian theorists, the process by which, in any given language, certain sentences are perceived as correct while others are not, is universal and independent of meaning. Thus, we immediately perceive that the sentence “Robert book reads the” is not correct English, even though we have a pretty good idea of what it means. Conversely, we recognize that a sentence such as “Colorless green ideas sleep furiously.” is grammatically correct English, even though it is nonsense. A pair of dice offers a useful metaphor to explain what Chomsky means when he refers to universal grammar as a “set of constraints”. Before we throw the pair of dice, we know that the result will be a number from 2 to 12, but nobody would take a bet on its being 3.143. Similarly, a newborn baby has the potential to speak any of a number of languages, depending on what country it is born in, but it will not just speak them any way it likes: it will adopt certain preferred, innate structures. One way to describe these structures would be that they are not things that babies and children learn, but rather things that happen to them. Just as babies naturally develop arms and not wings while they are still in the womb, once they are born they naturally learn to speak, and not to chirp or neigh. Until Chomsky propounded his theory of universal grammar in the 1960s, the empiricist school that had dominated thinking about language since the Enlightenment held that when children came into the world, their minds were like a blank slate. Chomsky’s theory had the impact of a large rock thrown into this previously tranquil, undisturbed pond of empiricism. Subsequent research in the cognitive sciences, which combined the tools of psychology, linguistics, computer science, and philosophy, soon lent further support to the theory of universal grammar. For example, researchers found that babies only a few days old could distinguish the phonemes of any language and seemed to have an innate mechanism for processing the sounds of the human voice. Thus, from birth, children would appear to have certain linguistic abilities that predispose them not only to acquire a complex language, but even to create one from whole cloth if the situation requires. One example of such a situation dates back to the time of plantations and slavery. On many plantations, the slaves came from many different places and so had different mother tongues. They therefore developed what are known as pidgin languages to communicate with one another. Pidgin languages are not languages in the true sense, because they employ words so chaotically—there is tremendous variation in word order, and very little grammar. But these slaves’ children, though exposed to these pidgins at the age when children normally acquire their first language, were not content to merely imitate them. Instead, the children spontaneously introduced grammatical complexity into their speech, thus in the space of one generation creating new languages, known as creoles. Many authors, adopting the approach of evolutionary psychology, believe that language has been shaped by natural selection. In their view, certain random genetic mutations were thus selected over many thousands of years to provide certain individuals with a decisive adaptive advantage. Whether the advantage that language provided was in co-ordinating hunting parties, warning of danger, or communicating with sexual partners remains uncertain, however. Chomsky, for his part, does not see our linguistic faculties as having originated from any particular selective pressure, but rather as a sort of fortuitous accident. He bases this view, among other things, on studies which found that recursivity—the ability to embed one clause inside another, as in “the person who was singing yesterday had a lovely voice”—might be the only specifically human component of language. According to the authors of these studies, recursivity originally developed not to help us communicate, but rather to help us solve other problems connected, for example, with numerical quantification or social relations, and humans did not become capable of complex language until recursivity was linked with the other motor and perceptual abilities needed for this purpose. (Thus recursivity would meet the definition of a spandrel offered by Stephen Jay Gould.) According to Chomsky and his colleagues, there is nothing to indicate that this linkage was achieved through natural selection. They believe that it might simply be the result of some other kind of neuronal reorganization. 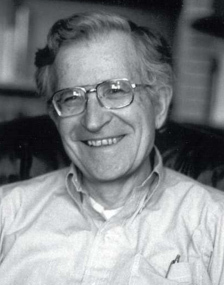 In the 1990s, Chomsky’s research focused on what he called the “minimalist program”, which attempted to demonstrate that the brain’s language faculties are the minimum faculties that could be expected, given certain external conditions that are imposed on us independently. In other words, Chomsky began to place less emphasis on something such as a universal grammar embedded in the human brain, and more emphasis on a large number of plastic cerebral circuits. And along with this plasticity would come an infinite number of concepts. The brain would then proceed to associate sounds and concepts, and the rules of grammar that we observe would in fact be only the consequences, or side effects, of the way that language works. Analogously, we can, for example, use rules to describe the way a muscle operates, but these rules do nothing but explain what happens in the muscle; they do not explain the mechanisms that the brain uses to generate these rules. Chomsky thus continues to believe that language is “pre-organized” in some way or other within the neuronal structure of the human brain, and that the environment only shapes the contours of this network into a particular language. His approach thus remains radically opposed to that of Skinner or Piaget, for whom language is constructed solely through simple interaction with the environment. This latter, behaviourist model, in which the acquisition of language is nothing but a by-product of general cognitive development based on sensorimotor interaction with the world, would appear to have been abandoned as the result of Chomsky’s theories. Since Chomsky first advanced these theories, however, evolutionary biologists have undermined them with the proposition that it may be only the brain’s general abilities that are “pre-organized”. These biologists believe that to try to understand language, we must approach it not from the standpoint of syntax, but rather from that of evolution and the biological structures that have resulted from it. According to Philip Lieberman, for example, language is not an instinct encoded in the cortical networks of a “language organ”, but rather a learned skill based on a “functional language system” distributed across numerous cortical and subcortical structures. Though Lieberman does recognize that human language is by far the most sophisticated form of animal communication, he does not believe that it is a qualitatively different form, as Chomsky claims. Lieberman sees no need to posit a quantum leap in evolution or a specific area of the brain that would have been the seat of this innovation. On the contrary, he says that language can be described as a neurological system composed of several separate functional abilities. For Lieberman and other authors, such as Terrence Deacon, it is the neural circuits of this system, and not some “language organ”, that constitute a genetically predetermined set that limits the possible characteristics of a language. In other words, these authors believe that our ancestors invented modes of communication that were compatible with the brain’s natural abilities. And the constraints inherent in these natural abilities would then have manifested themselves in the universal structures of language. Another approach that offers an alternative to Chomsky’s universal grammar is generative semantics, developed by linguist George Lakoff of the University of California at Berkeley. In contrast to Chomsky, for whom syntax is independent of such things as meaning, context, knowledge, and memory, Lakoff shows that semantics, context, and other factors can come into play in the rules that govern syntax. In addition, metaphor, which earlier authors saw as a simple linguistic device, becomes for Lakoff a conceptual construct that is essential and central to the development of thought. Lastly, even among those authors who embrace Chomsky’s universal grammar, there are various conflicting positions, in particular about how this universal grammar may have emerged. Steven Pinker, for instance, takes an adaptationist position that departs considerably from the exaptation thesis proposed by Chomsky.